Despite being a very small sample size, the statistical results suggest that there’s something here. The higher Conversion Rates are intriguing but what is really peeking my curiously is the fact that the Shooting Percentage is so much higher on shots from Central Channel Passes. When a shot was on target, it beat the keeper 53% of the time if the shot came via a Central Channel pass, while all others shots beat the keeper 32% of the time. When we peel back some of the underlying layers, the results get even more intriguing. When you only focus on Scoring Chances (kicked shots from heart of the box & kicked or headed shots from the six yard box), the Shooting Percentage was 60% on Scoring Chances set up by Central Channel passes compared to 47% on those shots that weren’t. On headers from the heart of the box, the difference in Shooting Percentage was 71% (!) compared to 43%. Let’s face it, the data suggests that the goalkeeper is truly struggling to react to shots coming from Central Channel Passes. 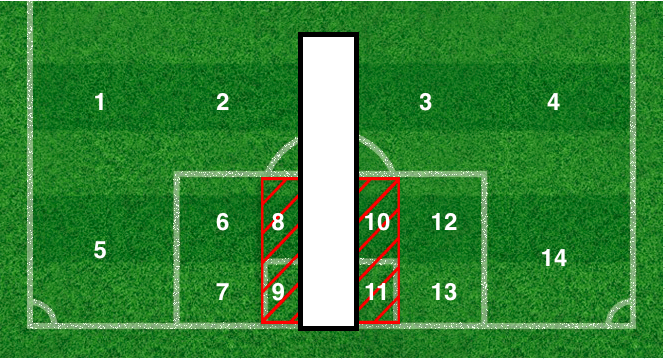 The data is one thing, but what’s missing is the point of view of the player tracking the ball….on the pitch. I reached out to Derek Gaston, who has been the starting goalkeeper for Morton since 2011. Prior to that, he started in goal for Albion Rovers & has been getting regular minutes as a professional goalkeeper since 2009. Derek has helped me in the past when I tracked stats during Rangers 2015-16 season in the Scottish Championship and yes…he actually makes the save in the cover photo of this post. I sent along the first part of this series & he generously sent back his analysis of Central Channel passes. Watch Paul Hanlon on this clip as he gets caught chasing the ball rather than marking the player he was originally tracking – which leads to an open shot on goal. Gaston’s perspective is very much aligned with what former NHL goaltender, Steve Valiquette claimed when he introduced the concept of the Royal Road pass. Goalies are forced to move across the goal, which makes it more difficult to them to deliberately close down shooting angles. Additionally, Gaston’s comment about the movement of multiple players moving along the sightline of the goalie is a layer of distraction that gives the attacking team a real advantage. I’d assume a goalie’s eyes are always tracking the ball & when they lose sight of the ball, even if it’s for a second, then that will impact their reaction to the pending shot. The data from this little study suggests there’s something here. That spike in Shooting Percentage on Central Channel shots is an entry point to a potential tactical advantage. The insight shared from Derek Gaston adds another layer of validity to the statistical results. Everything is pointing to going all-in on a large scale study looking at shots that come from Central Channel passes. For now, given my current project of tracking stats for the Scottish Premiership season, anything else will have to hold-off until the summer. However, if anyone reading this has a WyScout account & is willing to help track some shots – then feel free to reach out to me. If I had the help, this is something we could do sooner, rather than later. Thanks again to Derek for his time & his insight. ← Central Channel Passes, Pt. 2 – turning meh into yes!!!!!!!!! !